Fiat 500 C prices revealed | What Car? Fiat has released prices for the convertible version of its 500 city car. The entry-level 500 C 1.2 Pop will cost 11,300, with the range-topping 1.3 Mjet Lounge hitting the showrooms with a pricetag of 14,100 both of which come at a 3200 premium over the comparable hatch version. Fiat has also said that the UK will be the first country to get the new 500 C when it goes on sale in the summer. Pop and Lounge versions of the 500 C will be available from launch. All models get an electrically operated hood, air-conditioning, seven airbags, remote central locking, a CD player and electric door mirrors. Moving up to Lounge trim adds stability control, climate control, rear parking sensors and front foglights. Fiat's hands-free entertainment and communications system, Blue&Me, along with its eco:Drive technology, which helps owners drive more economically, is also standard on all Lounge models. 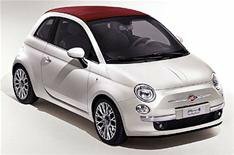 The 500 C will be available in 11 colours, with three for the roof: red, ivory, or black. Pop interiors can be specified with either ivory or black finish, and red or grey cloth seats, while Lounge offers an ivory or black interior, with black or brown cloth seats. Leather seats are also an option. Engine choices are the same as in the hatchback: a 75bhp 1.3-litre diesel, along with 69bhp 1.2-litre and 100bhp 1.4 petrols. The engines all have Fiat's fuel-saving Start&Stop system as standard.